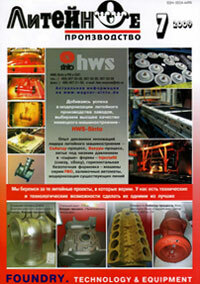 The main obstacles on the way to the wide adoption of frozen molds in the industry have been analyzed. Technological and organizational methods of overcoming those obstacles are shown. Examples of practical implementation of the recommended methods are given. Special attention is paid to the organic unity of frozen cores and V-process of molding. Lower cost of frozen cores as compared to cold-hardening ones has been substantiated. The necessity of using frozen cores for V-process molds is substantiated. Obrezkov V.V. et al. The Advantages of Water Glass Preparation from Dry Concentrate A new high-speed method of making water glass (WG) from dry concentrate (DC) has a number of advantages over the conventional methods. It is versatile, allows to rapidly prepare batches of binder of any volume with any required modulus and density, no steam autoclaves being required. WG produced from DC features new properties: high strengthening speed, higher heat resistance, better shakeout capability. Finished WG is used both in hot state immediately after production and as cooled for various foundry and metallurgical purposes. The article discusses the participation of foundries in the Perm Territory and Udmurtia in the commercialization of the technology of manufacturing high-quality foundry alloys and a wide range of motorcycle parts by die casting. A procedure of designing the process parameters for feeding castings by an example of designing a process of making large-size gear wheel castings is presented. Thermal conductivity and thermal capacity of molds made by the three-dimensional printing method have been calculated experimentally. Samples produced on printers by two different producers: ZCorporation (ZPrinter 310 model, ZCast powder) and ProMetal (S-15 model, S-15 mixture) have been examined. It has been found that ZCast mixture has a 1.3 times lower thermal conductivity and an almost 1.5 times lower thermal capacity as compared to S-15 mixture, which must be taken into account in developing casting technology using those materials. Investigations into the stressed-strained state of electrophoretic shell molds during their calcination depending on heating rate are presented. The investigations were conducted using mathematical modeling and experiments. Effect of some production parameters on the dimensional accuracy of investment casting patterns is discussed. The article discusses the main factors influencing the mold erosion, and measures of eliminating its negative consequences. The term "mold erosion" has been defined more precisely and broadened. Boldin A.N. et al. Peculiarities of High-Strength Cast Iron Production from Recyclable Resources. Some production features of ductile iron made of secondary resources are described. Effect of alloying elements introduced as graphitizers on cast iron chill was investigated.